In a continued celebration of our third anniversary, Artetude is pleased to feature founding sculptors, Amy Medford and Leonid Siveriver together with iconic photographer Robert Asman for Asheville in the Third Dimension. The figureheads of Siveriver's striking Spirit series appear, at first glance, as headdresses of the battle-ready. The longer one looks, however, the more one sees the familiarity of a face behind the armor. Next to the serrated edges and weatherworn surface of Siveriver's forms, Amy Medford's figures strain against their weighted pedestals, flesh wrestling to life from marble and clay, each caught in a moment of transformation. Complimenting these figures that stand and twist and rise up in space, we are proud to exhibit the stunning silver prints of Robert Asman. The artist's layering of special effects, expertly executed in the darkroom, create a dizzying sense of depth that transcends the two-dimensional nature of his medium. These featured artists have lived and worked in locales around the world, from Philadelphia and New Jersey to Israel and Italy, are now firmly planted on Asheville turf. "The Third Dimension" refers to objects in space in which depth is added to height and width. While sculptures are clearly three dimensional, Asman's mono prints create a 3-D feeling through the juxtaposition of subject matter and the layering of special effects done in the darkroom. There is also a philosophic meaning to "third dimension" in which the reality of significance is intensified by added dimensions. The works of Asman, Medford and Siveriver are all contemplative, and the deeper one looks, the more there is to be seen and felt. Artetude joined up with The Ramble Biltmore Forest for our POP UP Fine Art! event. This special event brought our fine art to the doorstep of some lucky locals who call The Ramble home. Attendees were able to enjoy refreshments and see original gallery artwork as well as a multimedia show designed to share insights into contemporary fine art. Sculptors Amy Medford and Leonid Siveriver met attendees and shared information about the creative and technical processes involved with making sculptures in materials that include bronze and marble. In case you missed it, we will be having more events coming up! 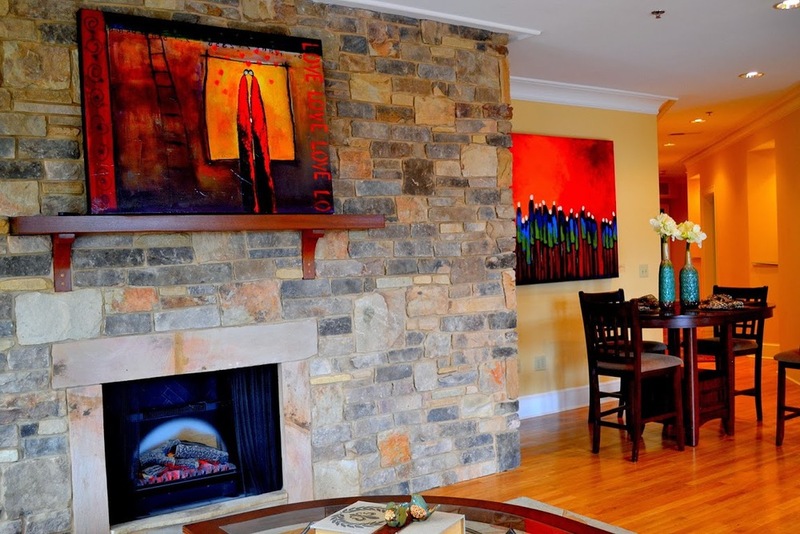 Come enjoy fine art, snacks and wine in the beautiful settings of these gated communities. Please see below for details. Please note these are events are free and open to our guests who RSVP, so that your name is on the list for the security gate. We look forward to introducing our friends and colleagues to our exciting contemporary art and the talented artists who create it. We hope you will be able to join us to enjoy art, music, food, drink and each others company at the height of the art season in beautiful Asheville, North Carolina. We are very excited to have these events in some of Western North Carolina's most prestigious gated communities. Leonid Siveriver describing the process of marble carving. Renowned sculptor Leonid Siveriver was on hand for our first Friday Art Walk back in April discussing the process of marble carving and bronze casting. Leonid welcomes the opportunity to share his knowledge with others interested in sculpture and ceramics. This summer he will be accepting new students in his Weaverville studio to showcase and teach his artistic language to others... Please contact the gallery for more information. After receiving his B.F.A. from the Bezalel Academy in Jerusalem, the Ukrainian-born artist followed his love of sculpture to Italy where he mastered marble carving at the renowned Foundry Tomassi. Leonid has also studied extensively at the Johnson Atelier Technical Institute for Sculpture in New Jersey, where he met Amy Medford who became his wife and co-creator. We are excited to introduce Bethany Pierce as our newest addition to the gallery family! Bethany was born and raised in southern Ohio were she attended Miami University, completing a B.F.A. in Painting and an M.A. in Creative Writing. After three years as a studio artist and gallery assistant at The McGuffey Art Center collaborative in Charlottesville, Virginia, Bethany relocated to Asheville to be a part of the vibrant River Arts District and to permanently call the Blue Ridge Mountains home. As gallery assistant, she looks forward to working with clients one-one-one to build beautiful private collections for both home and office. August 7th - September 30th, 2015. Dive into the depths of internal contemplation and expression. Maneuvering through our vast perceptions, memories and abstractions of the subconscious mind, these artists arrive into the confinements of creative clarity and expression, through introspection. "Reflections on the Natural World / Natural Viewpoints"
We are lucky enough to have artists from all over the Eastern US to share with us their viewpoints of the natural world around them. Through the mediums of painting and photography, we are allowed to take a peek into the many natural environments surrounding them. Copyright 2015 Artetude Gallery, All rights reserved. For more personal expression, he turned to painting and printmaking. Then he had what he calls his “Eureka moment” about eight years ago. A top sheet, with cutout lines of branches or leaves, became a reverse silhouette when layered against a contrasting bottom sheet. Going beyond his early botanical images, Penny now has a repertoire of themes: telephone poles and wires, bicycles, fire escapes, paper airplanes. They speak to his eye for simple, bold shapes. The flat figures emerge from a slightly mottled monochrome plane to create a mysterious space of their own. A new selection of Penny’s works, which he calls paper collages, is on display at Artetude Gallery in downtown Asheville in a group show that opens with a free public reception from 5-8 p.m. Friday. It’s part of the Downtown Asheville Gallery Association’s monthly Art Walk, which runs during the same hours and includes 23 galleries and shops. For a complete list of participants, visit downtownashevilleartdistrict.org. Penny, 41, moved to Asheville in 2003 from Sanford, North Carolina, with his wife, now a fourth-grade teacher at North Buncombe Elementary. Their daughter was born in 2011. His mother and stepfather were graphic artists, so “I grew up in their studios,” he said. After graphics training at a community college near Wilmington, he worked with them. His uncle, an advertising man in Boston, sent clients their way, and Penny still has many of the same ones. Because he was somewhat isolated in his home studio in East Asheville (“It’s not like I was rubbing elbows with other artists in the River Arts District,” he said), he began contributing work to the annual art auction of OpenDoors of Asheville, a nonprofit focused on lifting children out of poverty. “That’s where I got to meet a lot of artists,” he said. Penny found collectors for his work when he began showing at the downtown Minerva Gallery, which closed in December. 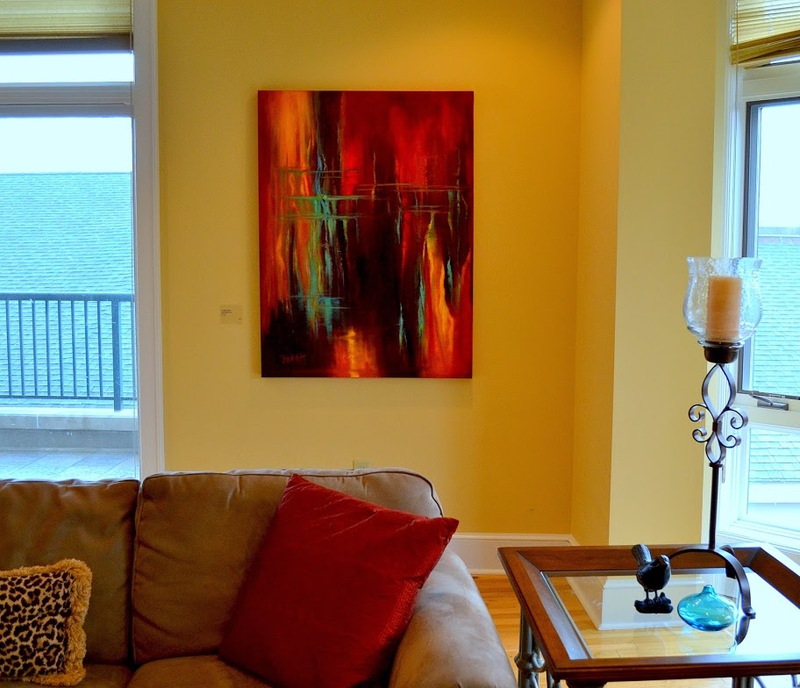 In addition to steering her clients to Penny’s work, she commissioned him to do some pieces for herself. “I asked him to do something he has never done again,” she said. “A lot of what I’ve done has been working with homeowners from dirt to move-in.” Penny made paper collages from blueprints of three of the homes. She bought three of Penny’s small botanical works first and then a large piece of a bike for her husband’s birthday. What: Asheville artist Grant Penny shows new works he calls paper collages in a group show with Suzy Schultz of Atlanta and Karen Titus Smith of Pemberton, New Jersey. Where: Artetude Gallery, 89 Patton Ave., downtown Asheville. When: A free public opening reception will be 5-8 p.m. April 3 during the First Friday Art Walk of the Downtown Asheville Gallery Association. The exhibit runs through May 31; the gallery is open 11 a.m.-6 p.m. Tuesday-Saturday. 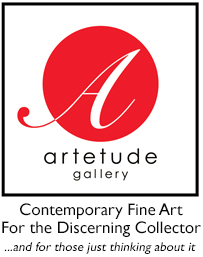 Learn more: Visit www.artetudegallery.com or www.grantpenny.com or call 828-252-1466." Suzy Schultz, Struggle, Solar Plate Etching, 16" x 11"
Artetude invites you to come celebrate the end of a long, cold winter as the gallery's newest artists, Suzy Shultz and Grant Penny, share the showcase with gallery luminary Karen Titus Smith in an exhibition that is sure to please. Artetude Gallery, a contemporary fine art gallery in downtown Asheville, invites art lovers to come celebrate the end of a long, cold winter as the gallery's newest artists, Suzy Shultz and Grant Penny, share the showcase with gallery luminary Karen Titus Smith in an exhibition that is sure to please. The show will open on April 3 and will continue through May 31, 2015. Refreshments will be served on April 3 from 5-8 PM as First Friday Art walks return to Artetude Gallery as part of the Downtown Asheville Gallery Association’s monthly gallery walk. Atlanta-based Suzy Shultz is an award winning artist whose poignant etchings capture the scars born from the battles of life and the dignity that comes with survival. Schultz is a master of “solar plate etching”, an etching technique that is friendlier to the environment and relies on the sun to make her imprints. She then goes over the etching with pastel and charcoal. Her works appear in numerous magazines and books throughout the U.S.
Grant Penny builds on his training as a graphic designer as he uses handmade papers to create fine art collages that are sublimely sophisticated in their simplicity. He mounts them on cradled boards that pop out of the wall. Grant is a North Carolina native, who has lived in Asheville since 2003. Grant Penny, An Example of How Simple it Must be to Build a Bridge, Paper Collage on Cradled panel, 36" x 36"
New Jersey-based artist Karen Titus Smith will be displaying paintings focused on themes from nature, some of which display stunning detail in their realism, and others in which the images have been broken down from their original forms and reconstructed in unique and visually captivating ways. She has won numerous awards, and her works are found in prestigious private and corporate collections throughout the U.S. and abroad. Karen Titus Smith, AB Plant, Acrylic on canvas, 42" x 42"
If you've been flying in or out of the Asheville Regional Airport, you may have noticed their current Art in the Airport gallery is now displaying nearly all of the local artists also being featured on our gallery walls! Next time you fly, take a peek at some of the masterful works on display from Asheville area artists Robert Winkler, Barbara Fisher, Robert Asman, Jo Ridge Kelley, Amy Medford and Leonid Siveriver. It will be “A Season of Sculpture” at Artetude Gallery this month. Featured will be works by three internationally recognized sculptors. Amy Medford’s sculptures bring out the natural qualities of the materials she uses, and communicate the subtleties of interpersonal relationships. She graduated with a degree in theatre history from Cornell University, and went on to earn an apprenticeship at the Johnson Atelier Technical Institute for Sculpture in New Jersey. It was there she mastered the “lost wax” technique of bronze casting. Leonid Siveriver’s creations evoke a powerful visual language that is inspired by ritual objects from ancient cultures. The iridescent sheen on his sculptures is the result of an unpredictable, and therefore exciting, process that is reminiscent of the original Japanese raku tradition. "At Artetude Gallery on Patton Ave., artist Leonid Siveriver blends mediums with his piece, “Motion.” Siveriver displayed a variety of pieces Dec. 5 during the last First Friday Art Walk of the season. (The gallery crawl series resumes again in April.) He said the idea of “Motion” came from photography — it’s a bronze casting of a man’s head, but it’s got a blur to it. “I wanted to show the same range of motion you’d see when taking a photo of someone with a slow shutter speed. It’s blurry when there’s movement,” Siveriver said." "New Beginnings" will be on view at Artetude Gallery until June 3, 2014. The artwork featured is emblematic of spring flowers and the beginning of new life. We are celebrating the warmer weather at Artetude, come experience this exhibit before summer is in full swing. Artetude Gallery is honored to add local Asheville artist Barbara Fisher to our group of unique and talented artists this month. Fisher has a great history of representation spanning four decades and both coasts. Fisher's work is included in many public collections such as the Foundation for the Carolinas in Charlotte, North Carolina, the Asheville Art Museum and the National Institutes of Health in Bethesda, Maryland. "Wake up Call", mixed media on wood panel, 36" x 42"
Congratulations to Artetude Gallery’s artist Kenn Kotara. Kenn was invited to create Braille art which is being featured in Optic Chiasm: The Crossing Over of Art and Science at the Ogelthorpe University Museum of Art (OUMA) in Atlanta, GA, through 4 May. Artetude Gallery owner, Dr. Margaret "Kenny" Offermann (left) stands with artist in front of Kotara's braille art installation at OUMA. Don't miss the Downtown Asheville's First Art Walk of the year! Please call 828.252.1466 or email our Gallery Assistant, Anna Elliott at aelliott@arteudegallery.com with any questions. Artetude Gallery is pleased to announce a collaboration with the Mason Murer Fine Art Gallery in Atlanta, Georgia in which one of our nationally represented artists, Leonid Siveriver, will be exhibiting several of his distinctive and provocative sculptural works as part of a group exhibition entitled “Old Friends and New Faces”. The exhibition opens at Mason Murer with an artists’ reception on March 28 from 6-9pm and will run through 2 May 2014. Mason Murer is Atlanta’s largest fine art gallery whose American Institute of Architects award-winning 24,000 square-foot space is unique in its scope and its offerings by focusing on a continually evolving selection of high quality contemporary works by regional, national, and international artists. Siveriver’s exhibition catalogue, “The Spirits 2014 Exhibition”, is available in print or online. For more information, contact Mason Murer Fine Art (199 Armour Drive, Atlanta, Georgia 30324, Tel: 404-879-1500, www.masonmurer.info, info@masonmurer.com) or Artetude Gallery (89 Patton Ave, Asheville, North Carolina 28801, Tel: 828-252-1466, www.artetudegallery.com, info@artetudegallery.com). We are delighted to announce that nationally recognized abstract artist Pat Zalisko will be joining Artetude Gallery in February. One of her first creative experiences involved childhood memories of painting intricate Ukrainian eggs. Many years later, her powerful and evocative abstract work often echoes the bright coloration of pysanky. This distinctly feminist art form was developed thousands of years earlier and has ritualistically been taught to Ukrainian girls and women. Born and raised in New York City, she was encouraged to pursue a practical career as an attorney. She retired from a successful legal career and fully embraced her passion for painting in her new Florida environs. Over the past several years, her art has regularly appeared in major private and public collections in the United States and abroad. Most recently, she was selected for inclusion in the prestigious Florida Biennial at the Museum of Florida Art, and her piece, Sidestepper, was published by the New York Times in June 2009 and subsequently featured in the exhibition, Rise-Fall, commemorating the twentieth anniversary of the fall of the Berlin Wall. The resulting visual language is a metaphor for life’s transitions and experience. Her work will be on view in the gallery beginning February 1, 2014. Jo Ridge Kelley, of Artetude Gallery has been honored with her work being featured on the label designs for North Carolina Wine Gifts of Asheville. Her labels use her recent paintings and will be served at Artetude Gallery during the First Friday ArtWalk, November 1st 2013. The soft-edged, expressive paintings of Jo Ridge Kelley are as much about emotional connection as they are about visual expression. Since childhood, growing up on a dairy farm in rural North Carolina, Kelley has felt a deep-rooted bond with nature’s perennial beauty and power. Every stroke of her paintbrush or palette knife is flowing with this lifelong passion as evidenced by the bold and powerful color harmonies and soothing organic textures. 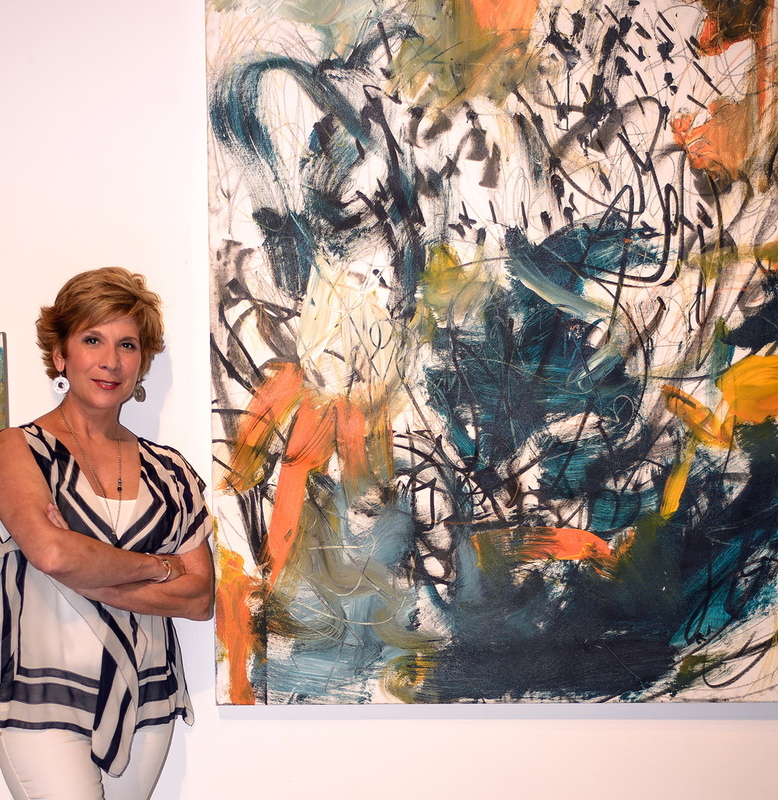 The paintings of Jo Ridge Kelley are seen in many private and corporate collections throughout the country and across the globe. Her work was featured in American Art Collector magazine, on the cover of “The Laurel of Asheville” magazine and numerous regional publications. Jo Ridge Kelley lives in Waynesville, NC with her husband, artist/ musician Ed Kelley.